east side bride: What should a trio of Aussies do in SAO PAULO? 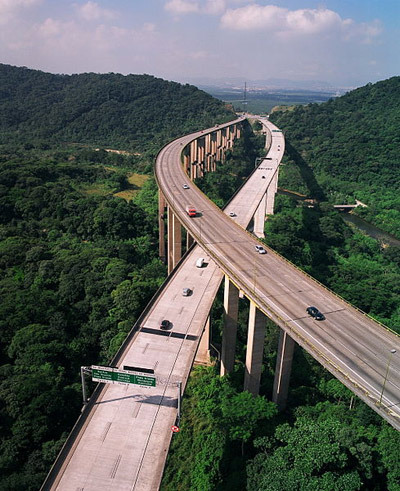 I'm heading to São Paulo for a friend's wedding in December. I'm hoping you or your fine readers can help me out with tips, accommodation, food and bars, day trips, etc. Overall we are looking for a fun and relaxing trip and are willing to spend mid-range prices. We will happily part with more money if it will save time and hassle. A final fashion question. The wedding is formal so I have a long one-shoulder dress to wear. It's very simple so should I fancy it up with a jacket or shawl? Or is it just too hot in December?? How formal is formal in Brazil? The lovely Mari (a real live BRAZILIAN!) stepped up to offer some recommends. São Paulo is a huge city. It has a population of more than 11 million people, and if we count the metro area that number grows to over 25. Brazil has a large number of immigrants and descendants, so anything and everyone are found there. If you want to eat Greek food, or learn Finnish, or dance like the Italians you can do it there. But I'll try to stay on Brazilian examples or extraordinary international ones. I need to begin by saying that São Paulo has its fare share of urban violence. I've never had a bad experience, but to ease my conscience I feel like I should mention it. I would advise those same security measures that any big city kid (or experienced tourist) knows by heart: don't wear super expensive flashy jewelry, never keep all of your money in the same place, be mindful of purse and backpacks (especially on public transportation, I have heard quite a few stories about backpacks getting emptied on the subway), don't carry around your original passport (carry a copy), don't flaunt your latest and super expensive phone and camera....you know what I mean?! 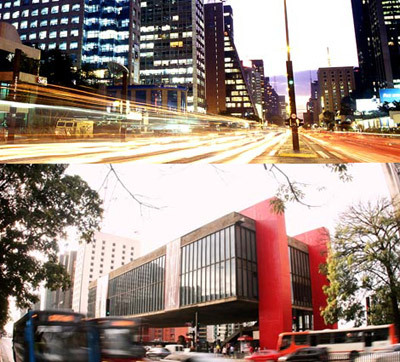 Paulista Avenue: is the modern heart of the city, is full of commercial buildings and filled of museums, art galleries, cinemas and shops on the street levels, and it ends at MASP (museum of art of São Paulo) and Trianon Park. I like to make a day of it -- if you like to sleep in, start with MASP and make your way down. MASP has, surprising to some, a great collection of European artists, from Renoir to Cezanne to Picasso. I also recommend the restaurant in the basement, which has an all-you-can-eat buffet with Brazilian food (Feijoada on Saturdays), a great meal for a reasonable price. Walk around Trianon Park, magically 5 degrees Celsius cooler inside. And this time of the year the whole avenue is decorated for Christmas, so stay well until the night to see it and later walk to Augusta Street, perpendicular to Paulista Avenue, which is full of bars, botecos, pubs, clubs, etc. Downtown + Pateo do Colégio (School Yard): You can do it by walking and taking the subway the larger bits. The Cathedral da Sé, a huge Neo-Gothic church, brands the middle of the city (personal opinion time: it is beautiful and makes you feel in the Old World for a moment and brings thoughts of older times, but then I found out it was built in the 50's!! And somehow all the wonderment vanished). Nearby we have the Monastery of São Bento, I have actually never been inside...heheh...but the building is gorgeous and if you are a careful planner they have an open mass with Gregorian chanting (if that is your thing, I for one would skip it!). I love Pateo do Colégio! This is a place that fills me up with Brazilian pride. I love the idea that what began as a school founded by a priest and a handful of boys is now the biggest city South of the Ecuador Line in the Americas. There's part of the college still standing, the church and an underground native museum. Luz + Pinacoteca + Portuguese Language Museum: You can find all these attractions at the Luz subway station, which is very pretty. Pinacoteca is a museum, this time filled with Brazilian work! I'm not sure what sort of experience non-Portuguese speakers would have in The Portuguese Language Museum. They usually pick a author for each month and make a showing of his/her work and life. Ipiranga: here was where the famous scream for independence from Portugal happened in 1822. Now it houses a museum on Brazilian history and XIX century way of life. Ibirapuera: is the biggest park around, it has a few museums (and a planetarium) around and in it. But is great for a stroll on weekdays, is insanely full of people on the weekends, and dogs, and kids, and bicycles, and skates...It is just full! MIS (Museum of Image and Sound): exactly what the name suggests...hehehe...every time I go there there is something different to see, and they have all these sculptures outside… I have never eaten in the restaurant, but it's on my list for my next trip to São Paulo. The little bistro is always open for a cold drink or a coffee, and they serve lunch until 15:00 (oh yeah in Brazil we use military time). SubAstor: the greatest cocktail bar! Ever! 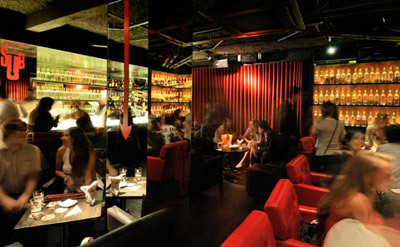 It is located under the Astor Bar, get the name Subastor?! I always make suggestions to everyone at the table so I can have a taste of everything...hehe...they have a immense variety of drinks and mixology options. Hecho in México: best Mexican restaurant outside of México! My trips to São Paulo are not complete until I come here. Surprisingly, their margarita is just ordinary, but they have michelada so they're forgiven. I usually complete my weekend trips with a movie (or theater) or even some shopping, São Paulo has so many things to do.... There are a bunch of options for clubs and late nights entertainment (one of biggest surprises the first time I went to US was that everything closes at 2am, there's no such thing in Brazil if you want to spend the night dancing you can). But when I'm in the city I don't really go out partying....so I really don't have any pointers on the topic. Pico do Jaraguá: The highest peak on the metro area is located on a State Park, in the outskirts of the city, about 40 minutes if you believe in Google Maps from Jardim Paulista to the park. You can get up there using the road, or a track. I went once years ago and don't really remember how I got there, but the view alone was worth it. 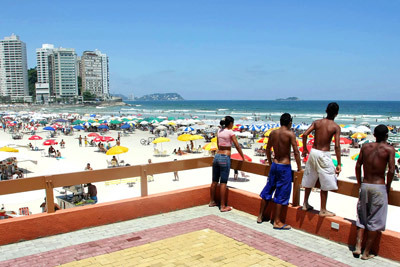 Beach: I always go to Guarujá, which is right next to Santos. It has a special place in my heart because I've been there at least once every year of my life, I'm actually curious to hear what international tourists would think about it. The city is filled with locals and people from the area, I have never seen anyone who came from far. If you're looking for a taste of Brazilian beach life this is it. There are urban beaches like Pitangueiras (my family has a summer apartment here), or Enseada and a few more deserts, nature-like beaches. To answer your fashion question, December is very hot. I usually spend Christmas in the area and only wore a jacket once (!!) in my entire life. Brazilian people are by definition pretty casual, and though we sometimes take an opportunity like a wedding to be fancy, even then our interpretation of formal, black-tie is very broad. I have been to formal wedding parties where even the mother of the bride was wearing a knee length dress. I personally don't think that a shawl or jacket is necessary, especially if the weather doesn't fit. I love my country and the people here, but we have no idea how to dress fancy for the cold. I was very surprised by the lack of soccer inquires...heheheh...If anybody else has more interesting suggestions, add them, please. Was just in Sao Paulo for work last month. Mari is right; the violence is a huge problem. Most bars and restaurants have leather straps to attach your purse to your chair while dining. Use them, and just be smart. A purse next to you in the car may cause problems at stoplights; drive with any personal belongings between your feet or on the floor out of the line of sight. The fun stuff: Casa 92 is really fun - it's right outside of a neighborhood called Villa Madelena which has some great bars & restaurants. Could spend an evening in this area and really enjoy yourself. Envious of this group! Have a blast! Thank you thank you! I have four days left and the downtown recommendations are just what I need, along with the bars. Sounds absolutely lovely, all if it! !